On our blog, you could read a lot of article on ERP topics. Below I will provide you a complete list of links to those posts. Despite you read about ERP implementation phases, I decided to focus on writing about the ERP life cycle in detail. Due to a great number of research papers written on this topic, there is no general view of the lifecycle thus you should make up your mind on what model to choose for your organization. First off, when I started writing this article, I found a conference paper written by Tingting Huang and Kazuhiko Yasuda which contained a comprehensive annotated bibliography review of literature related to the ERP life cycle concept. It turned out that the authors of the report have selected 26 original models of ERP life cycle stages introduced by different researchers. Just imagine, 26 papers! Each of those papers has its own description of ERP. There’s no wonder now why companies adjust their ERP portal to a certain model. How Different Are 10 Models of ERP Life Cycle? 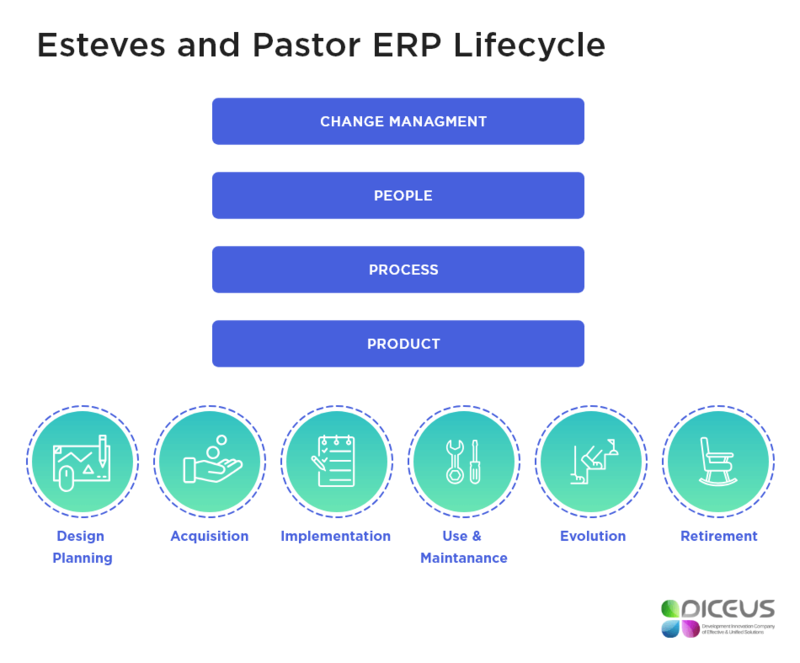 Esteves and Pastor first cited ERP life cycle in 1999. They offered a six-phase framework and chose dimensions to present distinct viewpoints. Each phase can be analyzed by four dimensions. They mentioned that most researchers focused only on the first three phases, but it was also important to have a general vision to prevent future problems. The significance of the framework is the retirement phase which is the first time been proposed in the ERP field. They provided a research map of ERP system’s issues and tried to draw the attention of practitioners and researchers to find the effects of ERP system in organizations. Based on the study of two dozen firms, the researchers adopted the framework of Soh and Markus (1995) to the enterprise systems experience with some changes. They also intended to provide a theoretical framework for analyzing the business value of enterprise systems. Phases, starting conditions, goals, plans, and quality of execution are considered to be the essential elements of this framework. In 2001, Stefanou pointed out the importance of the ex-ante evaluation and selection process of the enterprise systems. ERP evaluation is a complex, multi-facet activity including the evaluation of costs and benefits of ERP, and also the organizational, technological, and behavioral impact over time, which has to be taken into consideration throughout the entire life cycle. In contrast to the traditional linear model, this framework was not sequential but with some assumed circles. The author emphasized the importance of the phases before the implementation, and the perspective thinking regarding the benefits and costs, both financial and non-financial measures, throughout the whole cycle. Another life cycle model is the research of De Souza and Zwicker in 2001. By a multiple-case study in eight Brazilian companies, two different models for the large enterprises and the small and medium enterprises (SMEs) were proposed based on their former model. In 2009, they unified main features of many models into one with the well-defined stages. The interesting part is the last stage. It is divided into utilization stage and management stage, which exist at the same time. Additionally, the last stage feeds back the implementation stage whenever new needs appear. 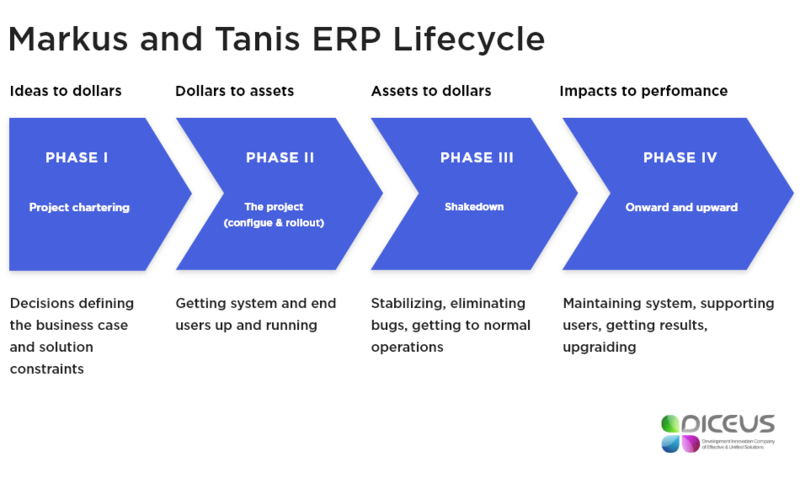 Although they mentioned the “retirement” stage may be one of the choices to improve the ERP system in organizations, this possibility is not included by their model. Bento and Costa (2013) are one of the latest researches on the lifecycle model of ERP. They divided the cycle into three phases and four stages, and were one of the few scholars that suggested the decline phase throughout the ERP lifecycle. They tried to establish a different perspective on many areas such as the initial phase. Additionally, twelve hypotheses during the ERP life cycle were proposed for future research. Law et al. (2010). Different from most scholars, Law et al. focused on the maintenance and support service after the implementation phase. By adopting a case study approach, the importance of planning and management of that service was proved. Based on the implementation model of Kwon and Zmud, they divided the project’s life cycle into four phases. In order to look at the relevant issues in a real-life context, two projects in an American-based multinational company with a strong presence in the Greater China region were the major objects. Kumar and Gupta tried to reduce the failure of ERP implementation by introducing Knowledge Management in the organization in 2011. An eleven-phase model of ERP implementation life cycle with two optional phases was proposed. The life cycle was considered to be used as the framework of organizing communities of practice composed of the different groups to overcome the difficulties of transferring, but the model was not been explained in detail, and the original of it as well. Dantes and Hasibuan (2011) introduced a conceptual framework of key success factors based on previous research; ERP implementation process and components involved in these processes were two dimensions of the framework. The specific processes were described in three perspectives: operational, managerial, and strategic. As you can see, although there is no general view of the IS lifesycle, each of the offered models has at least three to five phases or stages that are quite similar to each other. You should investigate the model you liked most in more detail to use it for your organization thus you might need some consulting services. What Open-Source ERP Java-Based Product to Choose? How to Successfully Implement an ERP System? A Free ERP Selection Process List: How to Pick up the Best-Suited IS? the system should provide support for serving the clients. 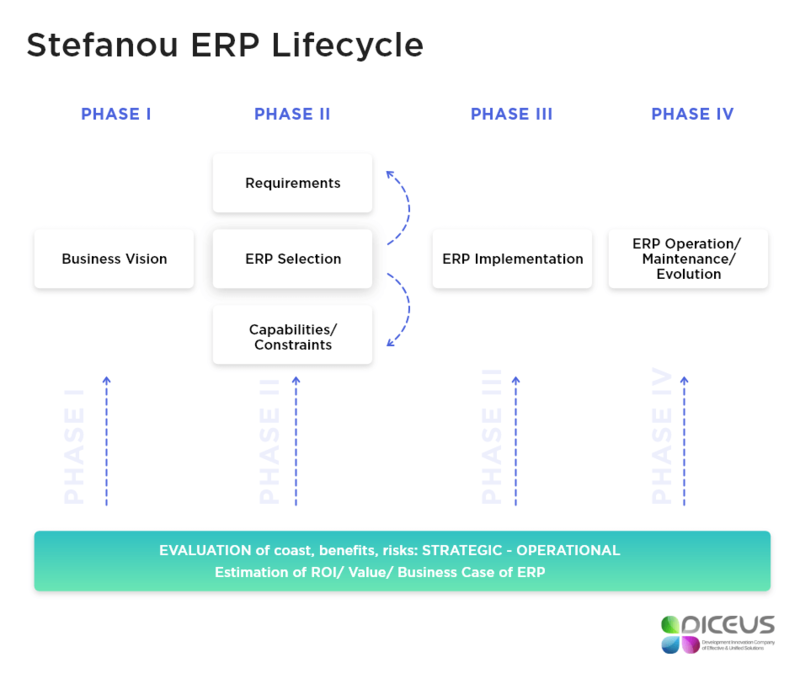 How to Choose an IS According to the Stefanou’s ERP Selection Framework? During the first phase, the company’s directions and objectives should be clearly determined. In the second phase, future and current changes in the organization should be taken into account. A large variety of core and extended modules and support services are offered by different vendors and third-party firms. The decision to acquire a particular system and the process of choosing are becoming increasingly complex in today’s changing and competitive environment. Enterprises pursuing systems integration must evaluate and select products that contribute to this goal without of course sacrificing the functionality of applications they believe are crucial for their business. Careful selection of vendors, products, and services provided is necessary but the final decision has to be made considering the number of organizational changes required for the adoption and the launch of the selected enterprise system.